Japan in the 10th century stood physically and culturally isolated from the rest of the world. Inside this bubble, a subtle and beautiful world was in operation, and its inhabitants were tied to the moment, having no interest in the future and disdain for the past. The Pillow Book of Sei Shonagon was a product of a tenth-century courtier's experiences in the palace of Empress Teishi. A common custom of the time period, courtiers used to keep notes or a diary in a wooden pillow with a drawer. This "pillow book" reflects the confident aesthetic judgments of Shonagon and her ability to create prose that crossed into the realm of the poetic. 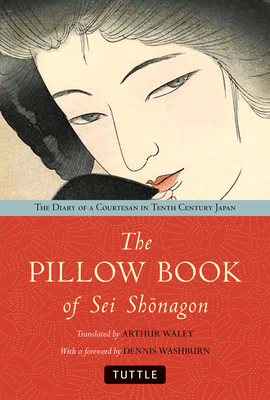 The Pillow Book of Sei Shonagon is one of the earliest examples of diary literature whose passages chronicle the events of the court calendar, the ceremonies and celebrations specific to Teishi's court, and the vignettes that provide brilliantly drawn glimpses into the manners and foibles of the aristocracy. A contemporary of Murasaki Shikibu, the author of The Tale of Genji, this small diary brings an added dimension to Murasaki's timeless and seminal work. Arthur Waley's elegant translation of The Pillow Book of Sei Shonagon captures the beauty of its prose and the vitality of Shonagon's narrative voice, as well as her quirky personality traits. In a place and time where poetry was as important as knowledge and beauty was highly revered, Sei Shonagon's private writings give the reader a charming and intimate glimpse into a time of isolated innocence and pale beauty. Arthur Waley (1889-1966) taught himself Chinese and Japanese after being appointed Assistant Keeper of Oriental Prints and Manuscripts at the British Museum. He was one of the most respected translators of Asian classics into English of his time, with his translated works including The Tale of Genji, Monkey (The Journey to the West) , The Noh Plays of Japan and The Analects of Confucius.